Goodbye, Mr. Chips (1939) was a popular romantic drama that has remained a favorite of audiences and critics who have seen the film over the years . 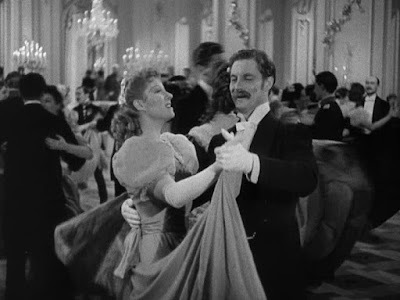 Produced by the British Division of MGM and shot in England, the film was directed by Sam Wood and starred two of my favorite screen performers – Robert Donat and Greer Garson. Donat, whose career was unfortunately hampered by chronic, possibly psychosomatic, asthma, was the memorable star of what I regard as one of the all-time greatest films, The 39 Steps (1935) . His performance here in Goodbye, Mr. Chips was equally commendable, and it earned for Donat an Oscar (US Academy Award) for Best Actor. Greer Garson, also originally British, was at the age of 34 making her screen debut in Goodbye, Mr. Chips, but she quickly established herself as a Hollywood superstar. Between 1939 and 1945 Garson earned six Oscar nominations for Best Actress, including one for Goodbye, Mr. Chips . One of my favorite of her roles is that of Paula/Margaret in Random Harvest (1942), a performance for which Garson couldn’t gain an Oscar nomination since she was already nominated for (and ultimately won) the Best Actress Oscar for her performance in Mrs. Miniver (1942). 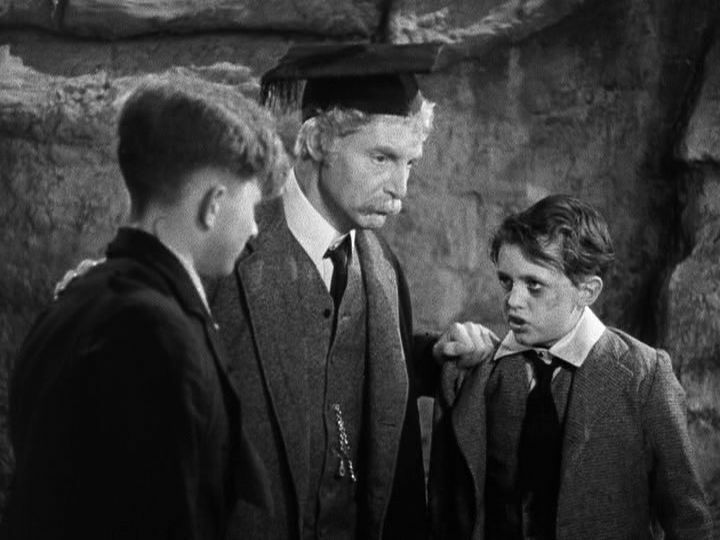 Overall, Goodbye, Mr. Chips was nominated for seven Oscars in 1939 – for Outstanding Production, Best Director (Sam Wood), Best Actor (Robert Donat), Best Actress (Greer Garson), Best Screenplay, Best Film Editing, and Best Sound Recording. Of course it was up against super-stiff competition, since this was also the year of the epic classic Gone with the Wind (1939), which also received Oscar nominations in those seven categories as well as in six others. 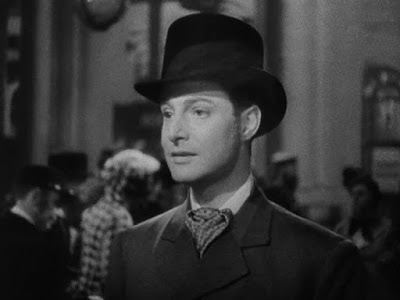 So it was a tribute to Robert Donat’s remarkable and sensitive portrayal of a man who ages 63 years over the course of Goodbye, Mr. Chips, that he won the Oscar for Best Actor over Clark Gable’s magnetic performance in Gone with the Wind. The story of Goodbye, Mr. Chips is based on the popular 1933 novella of the same name by James Hilton. Hilton authored two other stories that were turned into enormously popular films – Lost Horizon (novel - 1933, film version - 1937) and the aforementioned Random Harvest (novel - 1941, film version - 1942). All three of these filmed stories concern a man who stumbles upon something wonderful and then soon loses it – a special person or people who, for an all-too-brief period, show(s) and convey(s) to him the essence of joy and happiness. This story traces the life of a teacher in an exclusive, private English secondary school for boys (called a “public school” in the UK) from 1870-1933. The teacher, Mr. Chipping (“Mr. Chips”), is a modest, well-spoken man who begins his career at the Brookfield Public School timidly but who eventually evolves to symbolize the very heart and soul of the school. The evolution of Mr. Chips into a compassionate friend beloved by all the students is highly influenced by his relationship with his vivacious wife, whom he first meets as a middle-aged bachelor. The film’s narrative is presented over six phases, or acts, the middle four of which are extended flashbacks. To support the narrative continuity across these flashbacks, we are shown several generations of students from the same family – Peter Colley I, Peter Colley II, and Peter Colley III – all played by the same child actor, Terry Kilburn. 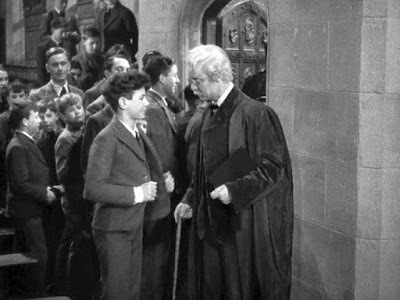 At the venerable Brookfield School’s first-day school assembly, the school’s headmaster announces that 83-year-old teacher Mr. Chipping (played by Robert Donat) is, for the first time in 58 years, unable to attend the session due to illness. However, we soon see the old man disobeying his doctor’s orders and belatedly trying to enter the assembly hall. When he finally sees the many boys departing the hall, it is clear that he knows most of them by name. Then he returns to his home near the campus, sits down, and begins reminiscing about his past. At his very first day at the Brookfield School, the 25-year-old Chipping is given the onerous task of beginning with an obstreperous class of 13-year-olds. The boys are all impudent and raucous, and soon the entire class descends into chaos, much to the chagrin of the mild-mannered Chipping. After getting a thorough chastising from the stern headmaster, Dr. Wetherby (Lyn Harding), Chipping vows to turn himself into a strict disciplinarian. When he later punishes his class one day by ordering them to stay in the classroom after school and thereby miss an important school cricket match, the boys can’t conceal their dislike for their too-serious teacher. Then a montage of dissolves indicates that time is passing. After Dr. Wetherby dies in 1888, Chipping, now sporting a thick mustache, has hopes that his many years of service at Brookfield will be rewarded by his appointment to a housemastership. However, he is greatly disappointed when he learns that he was passed over for the promotion. To cheer him up, his colleague Max Staeffel (Paul Henreid, who also appeared in Casablanca (1942)) insists on taking Chipping on a walking tour in his native Austria. On the trip, while walking alone one day in the Austrian mountains, Chipping gets fogged in on dangerous mountain pass. 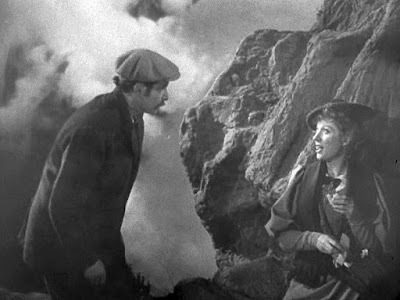 By chance, he encounters there a similarly fogged-in young English woman, Katherine (Greer Garson), and the two of them just have to sit down to wait for the fog to lift. While they converse, their contrasting personalities are on display. While the 43-year-old Chipping is politely diffident and starchy, the younger Katherine is ebullient and friendly. Nevertheless, Katherine becomes attracted to the somewhat old-fashioned Chipping, and they get on well together. When the fog lifts, they climb down to safety, and later they meet again in Vienna and share waltzes together in a ballroom. When it is time for Katherine to leave for England on a train, she impulsively kisses Chipping at the train station. As the train is departing, the til-now tongue-tied Chipping blurts out a hectic marriage proposal to Katherine, and she joyfully accepts. Back at Brookfield School, Katherine has an immediate impact on Chipping’s life and demeanor. She calls him “Chips”, a nickname that is immediately adopted by everyone, and she encourages him to treat all his students as personal friends. To support this new approach, she invites all his students to come over to their home every Sunday for tea and biscuits. And she also insists that Chips share his slyly witty sense of humor with his students in class. Her warm and affectionate nature is thoroughly passed on to Chips, and he becomes the same kind of person. In no time at all Chips becomes very popular with all the boys. And soon Chips gets his cherished promotion to housemaster. However, all this bliss turns out to be short-lived. During her first childbirth, Katherine and her baby die, and Chips is left shattered. When he quickly tries to immerse himself in his teaching, neither he nor his students can hold back the tears. Curiously, Katherine’s pregnancy and death are not shown in the film; they take place offstage and are only briefly discussed. The abrupt advent of Katherine’s death, however, does have a jarring effect on the narrative flow of the film that makes its tragic consequences even more dramatically affective. Overall, acts 3 and 4 of this story, which feature Katherine’s emotive and compassionate feminine contributions to the testosterone-driven all-male society at the Brookfield School, are the most memorable and significant components of the film. Now another montage of dissolves indicate the passage of some time, as boys are briefly shown commenting on various historical events over the years, such as the advent of the telephone, the Boer War, and the death of Queen Elizabeth. In 1909 a newly appointed Brookfield headmaster seeks to modernize the school and force the retirement of Chips, whom he sees as an old fogey. But Chips is now so popular with the students and faculty, thanks to the humanizing effect that Katherine had on him, that he has become almost a school institution. The protests of these students and colleagues force the new headmaster to back off and let Chips stay on. A few years later World War I begins, and when the headmaster along with a number of younger staff go off to serve in the military, Chips is appointed school headmaster. He feels that it is now his job to hold the school together on the home front. There is now another curious scene showing Chips caning a disobedient and hostile student. This is evidently intended to show Chips’s adherence to old, strict rules of loyalty during these troubled times. Indeed there is a general tone of national loyalty during this section of the film, as Chips tries to calm his students during German aerial raids and the receipt of disturbing news about allied war deaths. Among the excruciating pieces of news that Chips receives are the war deaths of his former student Peter Colley and of his great friend Max Staeffel, who was fighting on the other side of this senseless war. (We might say that all wars are senseless, but this one, with millions of war deaths, was particularly egregious, since the major parties entered into it voluntarily .) 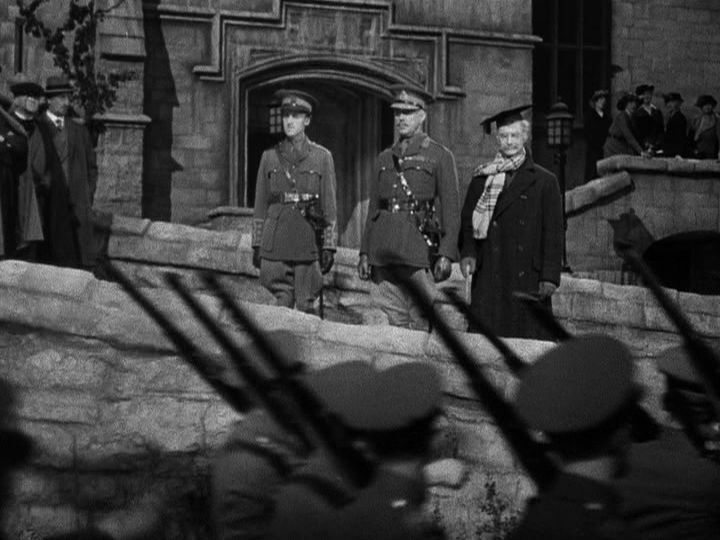 This general concern in the film for national loyalty should be seen in the light of the film’s production year, 1939, and England’s prospects of entering another world war. We now shift forward to 1933, and the aged Chips is visited by yet another young Peter Colley, of whom we have already seen many generations. With Chips taking ill, the boy departs and smilingly says, “Goodbye, Mr. Chips!”. Then a doctor and a colleague attend to the dying Chips and quietly lament that Chips had led a lonely life and had never had any children. But Chips, overhearing them, assures them in his last breaths that they are quite wrong; he had thousands of children! The lasting message we take from the film is that Chips had thousands of students during his life, all of whom he treated, after encountering Katherine, with the warmth and affection that one would give to one’s own children. He seemed to know and remember all of them by name. So Katherine’s spirited warmth and benignity, as well as her confidence-boosting support, were what brought out the inner humanity in Mr. Chips, and her impact is the key driver of the film. 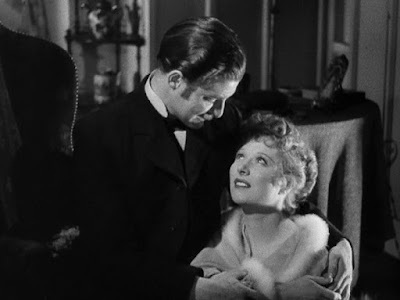 This is all underscored by Greer Garson’s vivacious performance as Katherine. Even though her presence only spreads across 35 minutes of a 113-minute film, she leaves a lasting impression on us, as well as on Mr. Chips. It is for this reason that her performance in a small-in-minutes role was nominated for an Academy Award. So Goodbye, Mr. Chips is adorned by two inspiring feats of acting – Robert Donat’s amazingly nuanced performance of a man, Mr. Chips, who ages across 63 years and Greer Garson’s vitalizing performance as his dear wife Katherine. Andrew Sarris, “New Thoughts on Two Old Movies”, The Village Voice, (14 July 1975). The Film Sufi, “The Film Sufi's 200 Greatest Movies”, The Film Sufi. Greer Garson received a seventh Oscar nomination for Best Actress in 1960. Jean-Francois Revel and Matthieu Ricard, The Monk and the Philosopher, Schocken Books, New York, (1998). 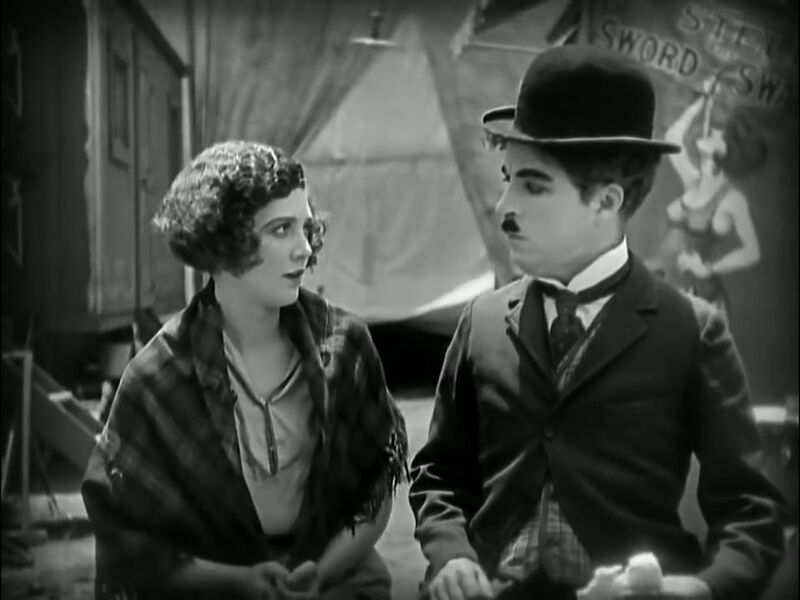 Charlie Chaplin’s” penultimate silent film, The Circus (1928), was an extravagant display of slapstick and a big hit at the box office, but it has not stood up over time as one of Chaplin’s great silent classics, such as The Kid (1921), The Gold Rush (1925), and City Lights (1931). Indeed, Chaplin, himself, didn’t even bother to mention The Circus in his 1964 autobiography . This neglect might be partly attributable to the fact that this film had a slightly different and more somber undertone than his other works. The Circus doesn’t just feature comedy; it is essentially about comedy and its often essential connection with loneliness. This more serious underside may have been connected with the difficult circumstances affecting Chaplin at that time [1,2]. Chaplin’s mother died that year, and he was going through a difficult divorce lawsuit with his teenage wife, Lita Grey. In addition, he was facing costly financial demands from the IRS concerning back taxes. There was also a major fire in Chaplin’s studio during production that burned some of the negative and ended up necessitating some reshooting. And, of course, there was always Chaplin’s ever-turbulent romantic relationships, which inevitably must have complicated his life. All of these things must have piled up on Chaplin and interfered with his meticulous film-production tendencies. As a result, it took Chaplin about two years to complete the production of The Circus. Nevertheless and despite the film’s obvious virtues, there are a couple of limitations that keep this work from achieving greatness. The two main narrative threads in the story – (1) the Tramp’s relationship with the girl horseback rider and (2) the Tramp’s progress in securing employment with the circus – don’t really go anywhere. They merely serve primarily as vehicles for a disconnected sequence of slapstick set-pieces. These set-pieces, it is true, are meticulously crafted, featuring amazingly adroit and subtle coordination between Chaplin and the person with whom he is interacting. The story of The Circus plays out over four movements. At the outset a traveling circus is shown, with its overbearing and short-tempered Ringmaster (played by Al Ernest Garcia) berating the glamorous circus horseback rider Merna (Merna Kennedy), who is the Ringmaster’s step-daughter, for some minor shortcomings in her performance. He tells her that as punishment she can’t have food that night. 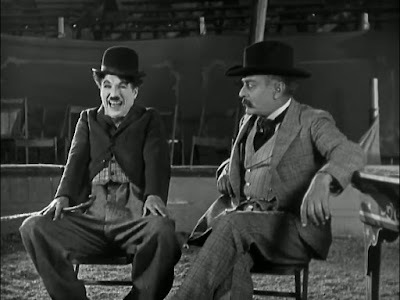 Then we shift to seeing the Tramp (Chaplin), penniless and hungry as always, lurking about the circus’s sideshows. There his back pocket is furtively used by a pickpocket as a temporary stash for a stolen wallet, and we move into the slapstick Pickpocket Sequence. Naturally, the Tramp is accused of the theft and comic confusion reigns. When the Tramp tries to flee the scene, he stumbles into the sideshow’s hall of mirrors, and we quickly move into the slapstick Hall of Mirrors Sequence. Still fleeing the cops, the Tramp runs into the circus ring and messes up the circus magician’s performance in the slapstick Magician Sequence. The circus crowd, which had been bored with the circus’s routine acts, is delighted by the Tramp’s antics in the circus ring, assuming his appearance there is a staged act. They immediately call out for more pranks from this “funny man”. All three of these hectic slapstick scenes – the Pickpocket Sequence, the Hall of Mirrors Sequence, and the Magician Sequence – are brilliantly performed, and they represent an early highpoint of the film. Later, after the circus’s show, the still-hungry Tramp meets the equally-hungry Merna, and they share some food together. The Ringmaster doesn’t want to see his step-daughter eat, but when he sees the Tramp and remembers the crowd’s demand for more of him, he calms down and decides to give the Tramp a tryout to join his circus show. in the ring) collectively quit just before the next show. Desperate to have his show go on, the Ringmaster then rehires the Tramp to be a property man. Again, the Tramp botches up all the performances, this time before a live audience. But the crowd assumes this is all staged hilarity, and it expresses its enthusiastic approval. The Tramp is now the unwitting star of the show. His property-man bungling gets incorporated as a regular feature of the circus. When the Tramp finally realizes he is the new star, he successfully demands from the Ringmaster a higher salary and that he stop bullying Merna. 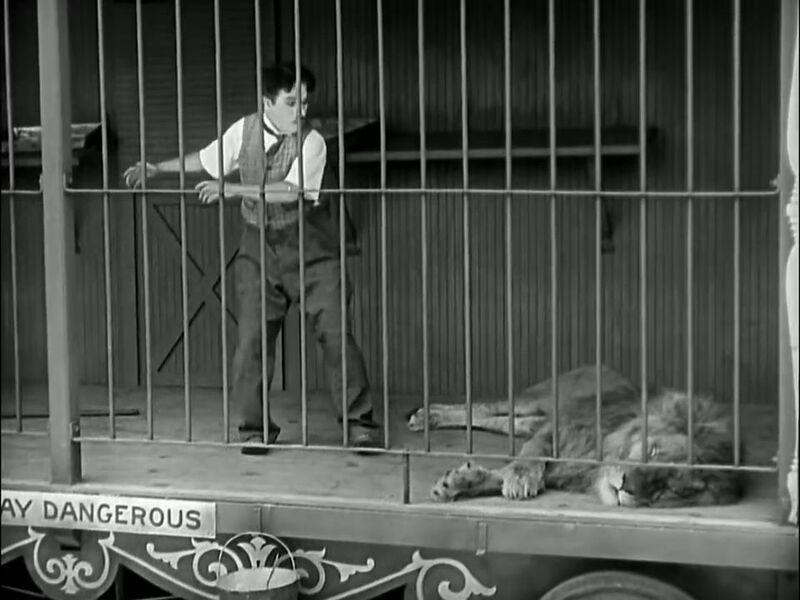 Later, when the Tramp is chased around by an enraged donkey, he seeks refuge in a circus wagon, not realizing he is entering a lion’s cage. 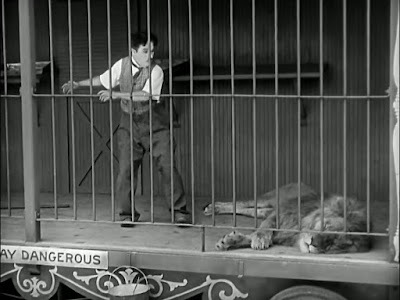 The ensuing slapstick Lion’s Cage Sequence is fascinating, because it shows Chaplin in close and exposed proximity to a lion (and also even a tiger). During all this time the Tramp has sometimes been meeting up with Merna and shyly succumbing more and more to her feminine charms. Merna visits the circus fortune teller, who tells her she is about to fall in love with a handsome man near to her. The Tramp surreptitiously overhears the fortune being told and jumps for joy. After all, he thinks to himself, he is handsome, isn’t he? He even hurriedly buys a wedding ring so that he can propose to Merna her at once. But soon a handsome tightrope walker, Rex (Harry Crocker), joins the circus troupe, and Merna immediately falls for his charms. The Tramp is crestfallen, and his resulting morose demeanor ruins his previously energetic circus performances. The crowd no longer finds him funny, and once more his job status with the circus is in jeopardy. Now the Tramp is consumed with jealousy, and he imagines himself, in a creative double-exposure shot, flooring Rex with a couple of punches. When he watches Rex doing a difficult turn on the tightrope, he hopes that Merna’s handsome suitor will fall. He even ridiculously strings up his own tightrope a couple feet above the ground so that he can practice walking on a tightrope himself well enough to match his rival’s prowess. But it is obvious that all his efforts are hopeless. However, one day Rex fails to show up for work, and the show-must-go-on Ringmaster, having seen the Tramp practicing on his makeshift tightrope, orders him to take Rex’s place on the high wire. The Tramp is scared, but given his shaky job status and his fervent desire to impress Merna, he goes ahead. 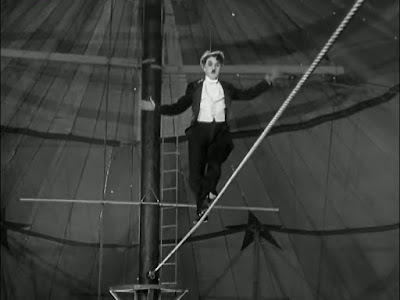 There follows the most famous slapstick scene in the film – the Tramp’s Tightrope Sequence. 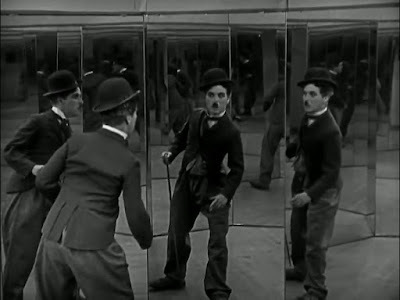 One can only marvel at how Chaplin managed to stage this amazing scene. Although the Tramp tries to cover himself by wearing a harness attached to a hidden safety wire manned by a prop man, the wire comes off and the Tramp is left on his own on the hire wire. Then, while the Tramp is trying to balance himself, a bunch of monkeys crawl out on the wire and climb all over him. They clamber all over his head and even remove his pants while the Tramp is still struggling to keep his balance. Chaplin needed over 700 takes to complete this incredible scene, which concludes with the Tramp riding a bicycle down a wire to the ground successfully [3,4]. When the Tramp gets back to the circus offstage, he sees the Ringmaster physically abusing his step-daughter again, and he angrily punches him out. This, of course, results in his permanent dismissal. 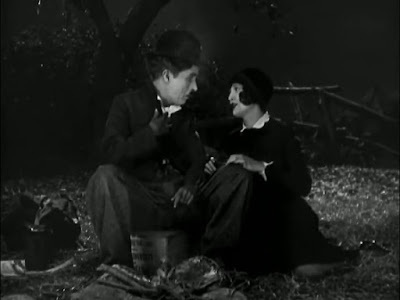 We next see the Tramp sitting alone that evening on the outskirts of town, but he is surprised to be joined by Merna. She tells him she has run away from the circus and wants him to take her with him. This is surely what the Tramp had dreamed of, but now mindful of his own impecunious circumstance, he here shows a hitherto unseen altruistic side of himself. He rushes off to summon Rex and get him to marry Merna, knowing this would be better for her. The marriage takes place the next day, and with the circus troupe ready to depart, the Ringmaster is mollified enough to accept Rex, Merna, and even the Tramp, back into his circus. But as the circus wagons start rolling out of town, the Tramp doesn’t climb aboard. Instead he just watches them pull away, and with a melancholic and resigned look on his face, walks off alone into the sunset. Each of them shows off Chaplin’s extraordinary agility and coordination with respect to his complicated surroundings of people and artefacts. But as I mentioned, the film overall is about the nature of comedy and its connection with loneliness. In this film the Tramp is at all times fundamentally alone. There is noone in the story with whom the Tramp fully resonates, not even Merna. Although the Tramp sometimes laughs in this film, noone laughs with him. He laughs alone. Everyone laughs at the Tramp. He is a perpetual object of derision. People put up with him only insofar as he can make them laugh at him. The Tramp gradually learns that this is his fate, and he reluctantly comes to accept this at the end of the film. In many ways when we laugh at something, we are often distancing ourselves from and dismissing something as absurd nonsense. Even when we laugh together, we are expressing our isolation from the object of laughter. Perhaps this was an existential revelation that Chaplin, himself, was coming to. The sound-movie era was already beginning – The Jazz Singer (1927) was released several months prior to the release of The Circus . 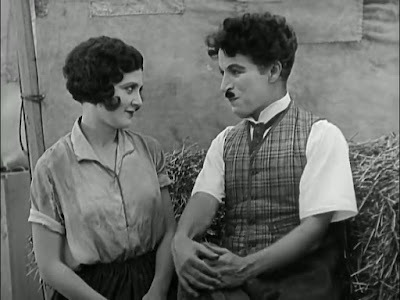 Chaplin probably knew that the silent-movie medium was doomed, and along with it its way of arousing the viewer’s empathy purely by visual expression. So his The Circus was a laugh-riot, but also something of an elegiacal swan song to the silent-film era. Alan Vanneman, “Looking at Charlie: The Circus: An Occasional Series on the Life and Work of Charlie Chaplin”, Bright Lights Film Journal, (30 April 2008). Roger Ebert, “The Circus”, Great Movie, RogerEbert.Com, (20 October 2010). Christian Blauvelt, “Film Review: The Circus”, Slant, (12 July 2010). Sam May, “Revisiting The Circus: Charlie Chaplin’s troubled comic triumph”, Little White Lies, (27 January 2018). Charlie Chaplin’s first feature-length film, The Kid (1921), was a breakthrough for the young actor/filmmaker. Although he was already famous for his many “two-reelers” (approximately 20-minute-length films) that featured his patented slapstick comedy, Chaplin wanted to move into the realm of more ambitious films by making a six-reeler that offered more sophisticated storytelling. What he came up with was a superb mixture of comedy and sentimentality that was an immediate hit at the box office and still stands as one of Chaplin’s most popular films. The distributor to which Chaplin was under contract at the time, First National, was impatient for more popular two-reelers, but the perfectionist producer-director-actor-writer-editor Chaplin took his time with the production of this film to fashion what he wanted . He riskily borrowed $500,000 and then spent about nine months shooting and reshooting scenes for this film (and about eighteen months in overall production time) to get just the kind of end result he was looking for [2,3]. 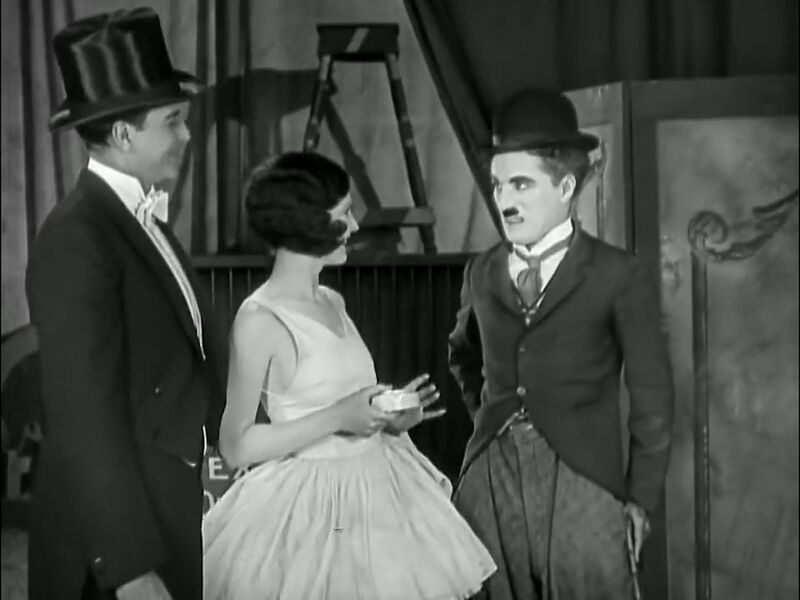 In fact Chaplin’s shooting ratio for this film (the ratio of total camera footage shot to footage of the released film) was 53:1, an extraordinarily high figure for any scripted production. The story of The Kid concerns Chaplin’s familiar “Tramp” character circumstantially forced into adopting an orphan newborn and then somehow raising the boy despite the Tramp’s impoverished circumstances. Along the way, the two of them develop a unique bonding that lies at the heart of the film’s appeal. Chaplin’s choice to immerse himself into this narrative was undoubtedly affected by the recent tragic death of his own newborn child. His 17-year-old wife Mildred had just given birth to a malformed son who had died due to birth defects after only three days in July 1919. 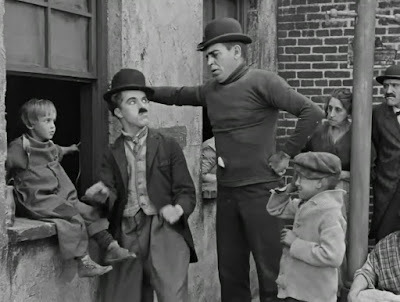 Chaplin was apparently traumatized by this event, and in response he almost immediately began working on the script and the casting for his new feature film about raising an abandoned child. 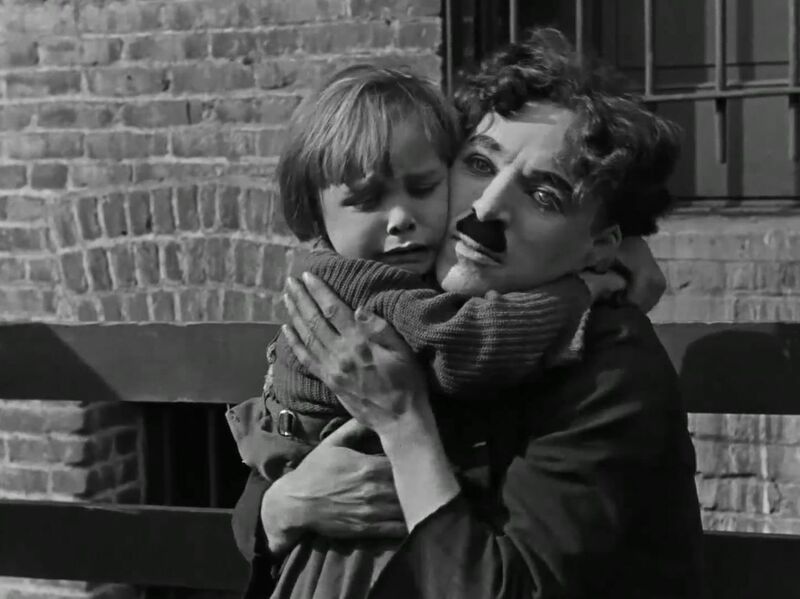 In this connection Chaplin was fortunate to stumble upon a four-year-old vaudeville performer, Jackie Coogan, who turned out to be just perfect for the role of the waif that is the Tramp’s adopted son in The Kid. Coogan’s performance in this film is still considered to be one of the greatest and most appealing child screen-acting performances of all time. "A picture with a smile—and perhaps, a tear"
and the film is largely devoted to combining these two sentiments. However, there are a couple of underlying themes in this tale that are worth discussing in this story’s context. 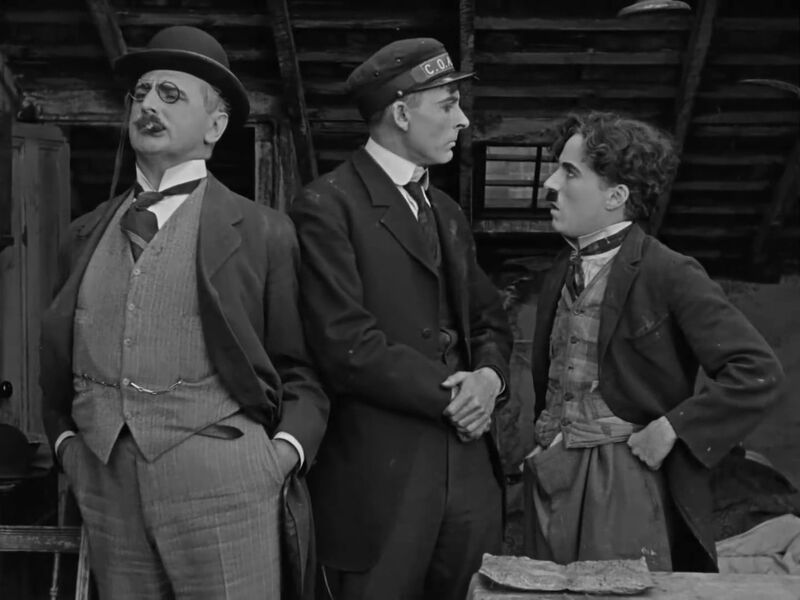 One concerns Chaplin’s Tramp character, himself, and how he differs from Buster Keaton’s usual silent-film character. Keaton’s character is invariably an earnest, middle-class innocent who, however inexperienced and ill-equipped he might be, wants to do the right thing according to the given social mandate. His problem, though, is that he is often faced with overwhelming external, “natural” forces that threaten to annihilate him. 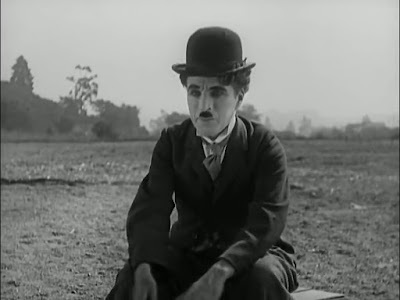 Chaplin’s Tramp, though, is not middle-class at all; he is an impoverished bum at the bottom of society. And the Tramp is certainly not innocent; he is a relentless poseur who ludicrously pretends to be what he is not – a dignified man worthy of respect. And he will cheat his more powerful adversaries in any way that he can. But the Tramp’s adversaries are not natural forces but a human society that has always stacked the deck against people like him. So the viewer sympathizes with the naughty Tramp in his endless struggle against big bullies and social prejudices. However, in this film under discussion, the inner nature and evolution of the Tramp’s own personal outlook on life becomes an issue. Another and related underlying theme in the film concerns how the moral fabric of society as a whole is buttressed by the religious beliefs commonly held in society. Although most religions assert that their principles have absolute, divinely-sourced authority, we know that the specificity and structure of these principles are actually human-made and subject to the limitations of human frailty . Chaplin, who was evidently an agnostic , alludes to the artificiality (i.e. non-divine) nature of these principles in this story (particularly towards the end), but he doesn’t completely debunk them, either. Instead, he seems to point to something deeper and more intrinsic about human nature that moves us to act with loving compassion for no apparent practical reason. And the way Chaplin portrays this is what makes The Kid a great film. The story of the film has six unequally-sized sections to it. 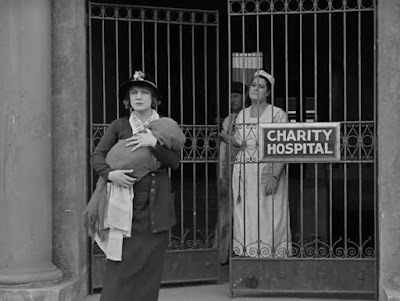 In the beginning we see The Woman (played by Edna Purviance, who was romantically involved with Chaplin before and around this time) who has just given birth to a child out of wedlock. In a panic that she doesn’t have sufficient means to support the child, she desperately looks for a way to pass the baby onto someone who can take care of it. When she walks by a luxurious sedan, she surreptitiously stashes her baby in the backseat and then hurries away. However, the car is then stolen by car thieves who, after discovering the baby in the back, dump the child near a trash bin in a city slum. 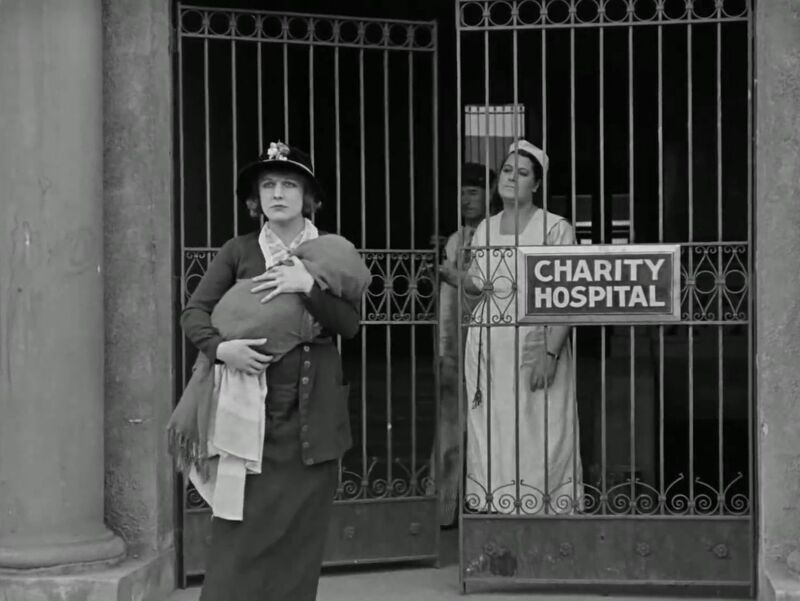 The Tramp (Chaplin, in his signature shabby outfit) happens to walk by and see the baby. He picks it up and looks for the baby’s owner, or at least for a mother who can take care of it. But in a series of slapstick misencounters, he fails to unload the baby on anyone, after which he comes under the suspicious eye of a watchful policeman (Tom Wilson) walking his beat. During this sequence The Tramp seems to have little concern for the baby and seems primarily concerned with getting out of trouble. However, in the end The Tramp’s efforts come to naught, and it looks like he will just have to look after the baby himself. Meanwhile the distraught Woman has second thoughts about giving away her baby and is distressed that she cannot find it. 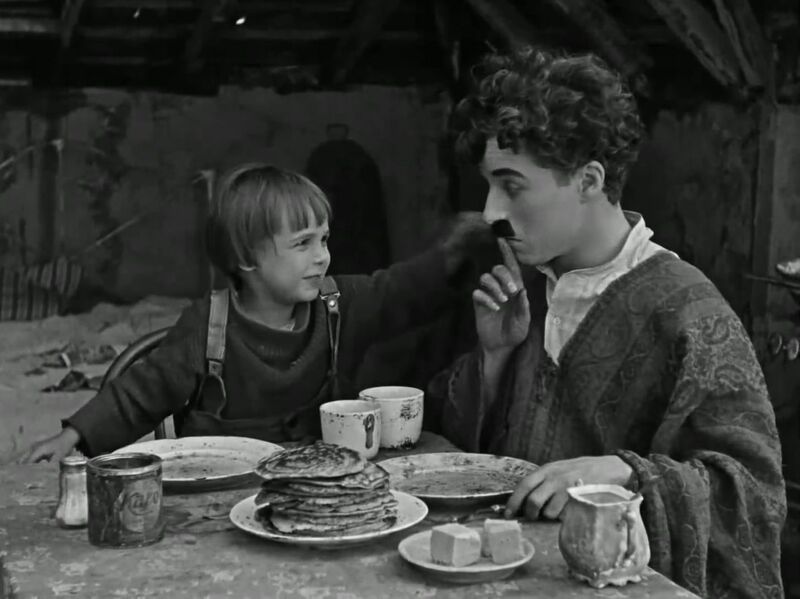 The story moves forward five years in time, and we see The Tramp and his reluctantly adopted child (Jackie Coogan), who has been named “John”, living together in The Tramp’s shabby flat. It is clear that the two of them are now a team and get on well with each other. They have worked out a business together, whereby John throws a rock breaking a random apartment’s window, and then The Tramp, operating as a street-vending glazier, just happens to walk by and offer to repair the window for a fee. Of course doing this requires dodging the watchful eyes of the policeman on his beat. Things get more hilarious when they unknowingly break the window of the policeman’s own flat, and The Tramp, while negotiating his glazier fee, brazenly flirts with the policeman’s wife. Just then the policeman returns home and, seeing what is going on, gets into a violent slapstick scuffle and chase with The Tramp. We also see that The Tramp, even though he makes money through duplicity, has somehow become a more responsible parent and has brought up John to know how to cook pancakes for breakfast, to say grace before meals, and to say his prayers before going to bed. In fact John appears to be more organized, industrious, and sincerely moral than The Tramp, himself. Meanwhile John’s mother, The Woman, is shown to have now become a star opera singer, but her newfound wealth does nothing to assuage her sorrow over her lost child. She tries to relieve her feelings of guilt by handing out gifts to children in the slums. One day an obstreperous bully steals a favorite toy from John, and the two of them get into a fight. The Tramp rushes over to break things up, but when he sees John surprisingly winning the fight, he lets them go ahead. But just then the bully’s muscular adult brother, whom we shall call “The Big Bully” (Charles Reisner), shows up and starts a fight with The Tramp. 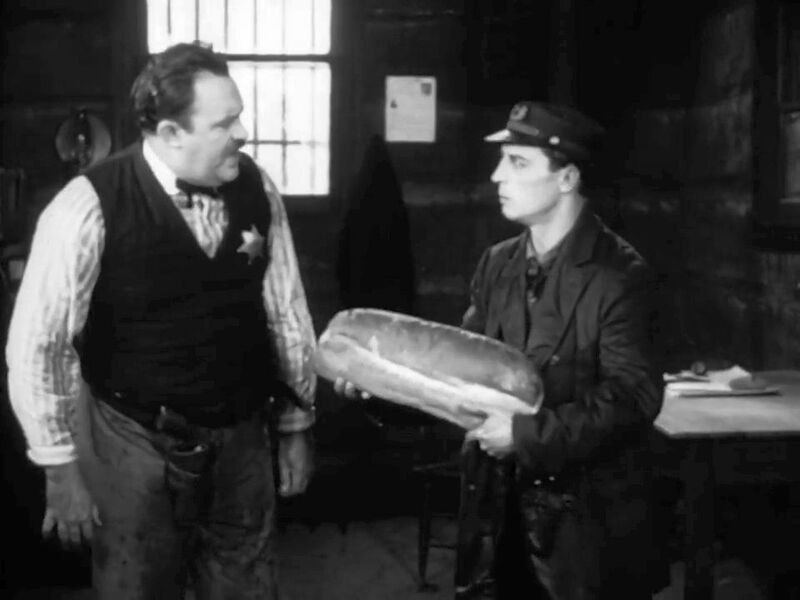 This is a major and extended slapstick scene in the film and features an epic, presumably one-sided, struggle between the ruthless roughneck, who can knock out a policeman with one punch, and the terrified Tramp, whose ducking and feinting just manage to save him from The Big Bully’s roundhouse blows. This The Big Bully dutifully does, but The Tramp merely uses this as an opportunity to deliver some sucker-punches. Again we see The Tramp’s disregard for conventional morality. He naughtily goes his own way. And Chaplin is suggesting here, too, that conventional morality is often unrealistically impractical and often just used as an instrument of oppression. The fighting continues, and The Tramp’s ballet-like dodging and darting gradually enable him win the fight. Afterwards, The Woman approaches The Tramp and informs him that she has found his “son” John, whom she does not know is actually her own son, and discovered that the boy is seriously ill.
Now “the system” enters the picture and causes trouble. A pompous doctor comes to treat John, and seeing The Tramp’s shabby household, informs the orphanage officials to come and take the boy away. The officials come, and although The Tramp and John temporarily fight them off, John is eventually taken away by force. It is here that we have the most moving scenes in the film, because it is here that it becomes clear that both John and The Tramp love each other. 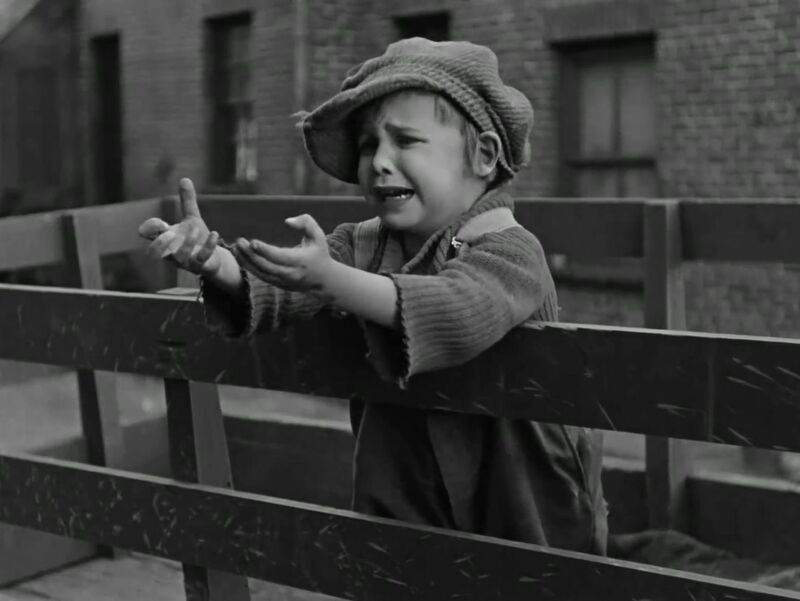 The poignant image of Jackie Coogan (as John) tearfully reaching out towards The Tramp as he is taken away is perhaps the most lasting image one has of the film. However, The Tramp now breaks away from the police, scoots away from them over the rooftops, and boldly rescues John from the abducting orphanage authorities. He and John then take cover for the night in a local slum flophouse. However, meanwhile The Woman has discovered that the ill boy she had recently seen was actually her own long lost child, and she has placed an ad in the newspaper offering a big reward to anyone who can help her find him. When the flophouse manager happens to read this ad, he steals John away from his bed while the boy and The Tramp are sleeping, and then he forcibly takes the boy to the police station. The Woman is duly notified, and when she arrives at the police station, she is thrilled to be reunited with her lost son. When The Tramp wakes up and discovers John missing, he spends the rest of the day fruitlessly searching for the boy. Finally, exhausted, he returns to his now locked-up doorstep, falls asleep, and starts to dream. 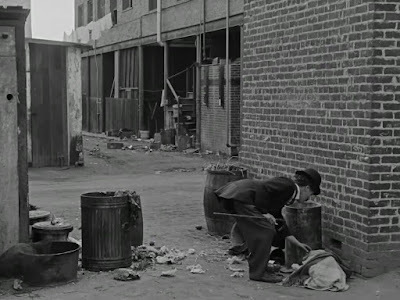 The dreamland that The Tramp now enters has been criticized by some viewers as a frivolous insertion to the story that has no meaningful connection to the existing narrative. But actually I think it has some connection to the two underlying themes that I mentioned earlier. In The Tramp’s dreamland, he finds himself in “heaven” – everyone has feathered wings, and they are all dancing joyfully about playing on their harps. Many of the people we have seen earlier are there, including the policeman and The Big Bully, but now they are all ridiculously festive and benevolent. Indeed this product of The Tramp’s imaginings is an absurd caricature of the heaven of popular culture. And like the rest of The Tramp’s world, it, too, is subject to corruption. Soon some sprightly demons sneak into the dreamland and sow the seeds of temptation and jealously. 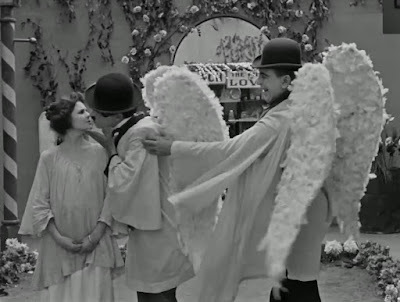 A flirtatious angel (played by 12-year-old Lita Grey, who in real life would marry Charlie Chaplin three years later) naughtily induces The Tramp to kiss her, and her boyfriend in this dreamland, The Big Bully, gets jealous. Soon The Big Bully and The Tramp are fighting, just as they had done in The Tramp’s wakeful state. Again we are treated to more slapstick theatrics between The Tramp and The Big Bully. But when The Tramp finally tries to escape the fight by using his wings to fly away, the hitherto (in the dreamland) benevolent policeman fires his gun at him and shoots him dead. The film now shifts back to the “real” world, and the policeman, finding The Tramp sleeping at his doorstep, wakes him up. Then, without explanation, he takes The Tramp away in his police car. But instead of taking him to the police station, he takes him to wealthy mansion. When the mansion door is opened, The Tramp is greeted by The Woman and John, who joyfully welcome him to their home. So in the end, happiness reigns. And the source of that happiness, Chaplin seems to be telling us, is not from following the artificial rules of society. All those explicit rules and guidelines of human society are just man-made concoctions that have their limitations. Even our religious principles that supposedly emanate from spiritual masters or divine inspiration are still artificial contrivances that have arisen from our imaginations. They are all restricted by the finite resources of the human mind. And the dreamland of this film is Chaplin’s exaggerated illustration of just how far our heavenly imaginations differ from the infinite. But the spontaneous love that arises from The Tramp and little John is something that transcends those limitations of the human mind. It is something that is heavenly. We cannot express it; we can only feel it when we see the visual narrative and relate it to experiences from our own lives. This is what elevates The Kid to a high level. Those images of John and The Tramp reaching out to each other to preserve (or frantically scrambling to support) their spontaneously evolved heartfelt connection are what stir sympathy in our hearts. Mark Bourne, “The Kid: The Chaplin Collection”, The DVD Journal, (2004). Andrea Passafiume, "The Kid (1921)", Turner Classic Movies, (n.d.). David Robinson, “Filming The Kid”, CharlieChaplin.Com, (2004). Yuval Noah Harari, Sapiens, A Brief History of Humankind, HarperCollins Publisher, (2015), Chapter 12: The Law of Religion, pp. 209-236. 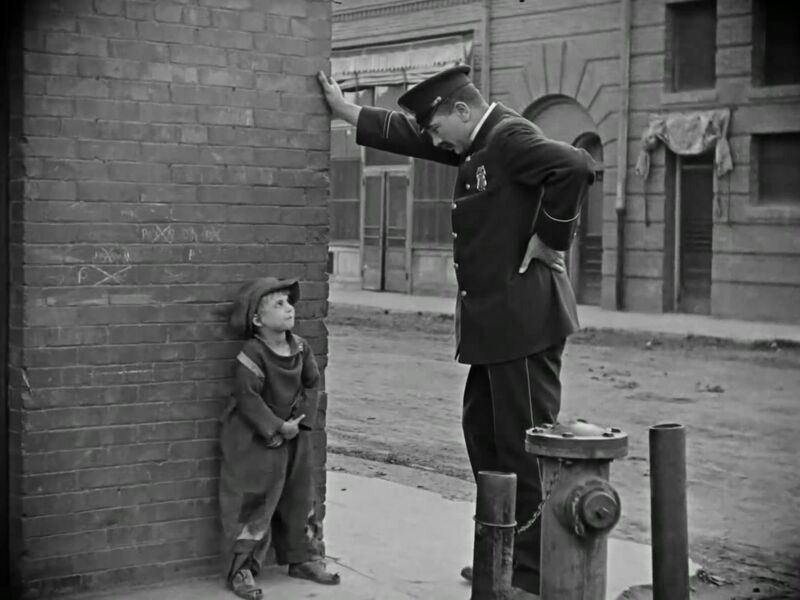 David Duprey, “The Kid (1921): A Brave Rescue”, That Moment In, (1 October 2014). 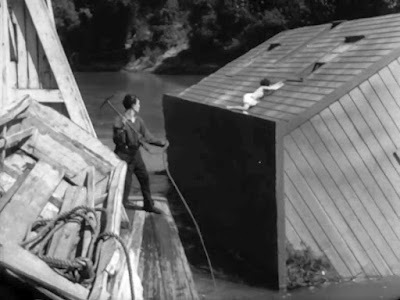 Buster Keaton’s Steamboat Bill, Jr. (1928) was the last brilliant product of his own, personally-managed production team, which had earlier produced an amazing string of silent classics that included Our Hospitality (1923), Sherlock Jr. (1924), The Navigator (1924), The General(1926), and Seven Chances (1927). These films collectively place Keaton among the elite list of great film auteurs, and in fact, some leading critics even rank Keaton ahead of Charlie Chaplin as the greatest silent-era auteur [1,2]. Although Steamboat Bill, Jr. belongs to this list of Keaton’s finest films, it was unfortunately not a hit at the box office and drew only mixed reviews from the critics (The New York Times critic, Mordaunt Hall, for example, panned the film ). Probably for these reasons, Keaton felt compelled to sign on with MGM studios for future productions, “despite the urgent warnings of Chaplin and Lloyd and his own misgivings” , and this led to his loss of production control and had disastrous consequences for his remaining career. So with Steamboat Bill, Jr. we have one of the last examples of Keaton’s greatness. the maelstrom (the protagonists facing a culminating blizzard of existential threats that seem to stem from inscrutable natural forces). However, in this film these narrative elements are somewhat disjointed and not so well fit together into a narrative whole. 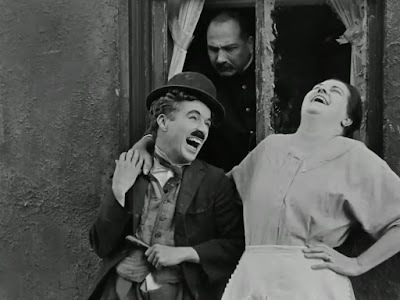 While more than half of the film running time is devoted to various standalone slapstick scenes, it is the final fourteen minutes showing the maelstrom that stand out in everyone’s memories. This was probably Keaton’s most dizzyingly delirious maelstrom sequence. 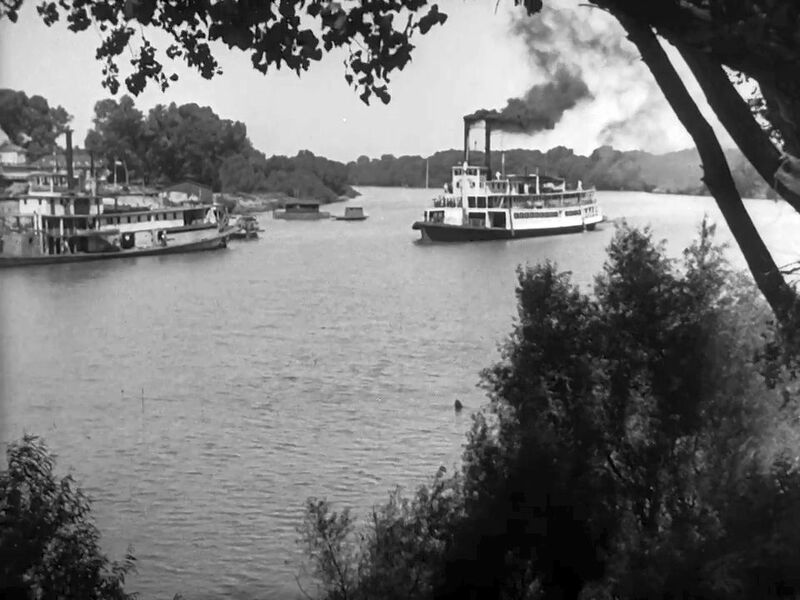 The story of the film concerns the unequal rivalry between two riverboat operators somewhere out in the American Midwest. One of them, William "Steamboat Bill" Canfield, Sr. (played by Ernest Torrence), is a rough-hewn captain of an old and rundown paddle steamer. 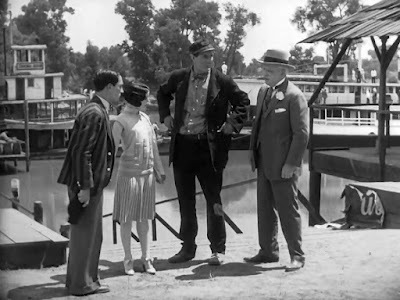 His business is threatened by rival John King (Tom McGuire), a wealthy businessman who owns about every establishment in town and whose fancy brand new steamboat is overwhelmingly superior to Steamboat Bill’s. This sets the stage for the three narrative sections that ensue. In the opening sequences we are exposed to the quaint. 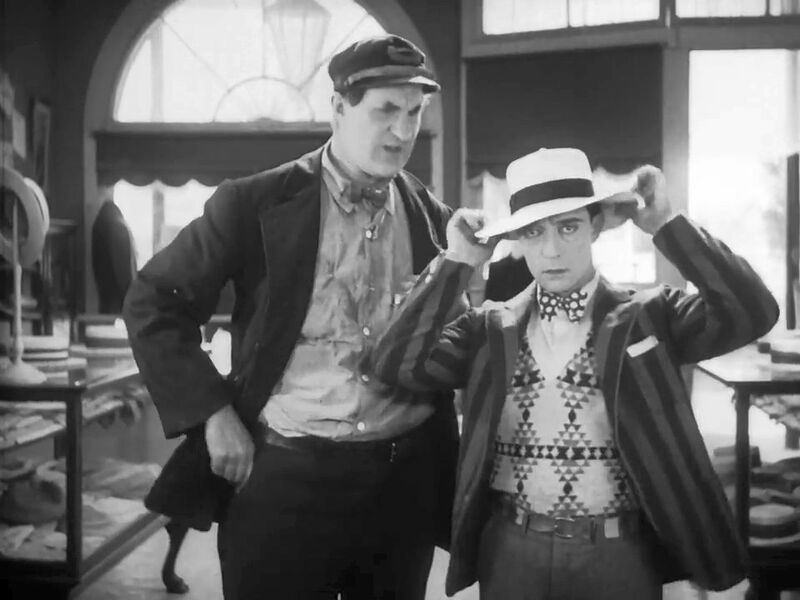 Steamboat Bill is eagerly looking forward to the arrival of his son, William Canfield, Jr. (Buster Keaton), who has been studying at college in the East (Boston) and whom he hasn’t seen since the boy was a toddler. The father is expecting that his son will be a strapping tough guy like himself who can help in his boating operations, and he is dismayed to see on the boy’s arrival that he is a useless, effeminate fop who wears a beret. 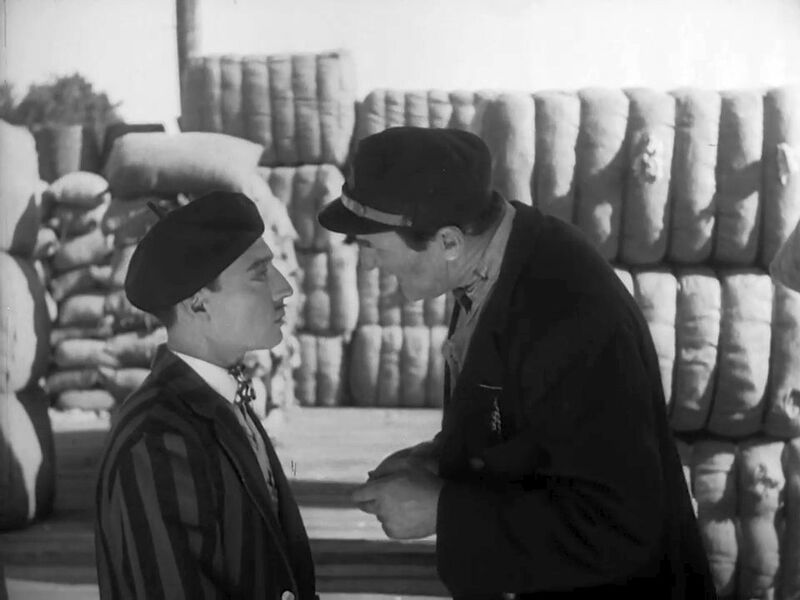 Much of this first twenty or so minutes of the film are devoted to the father’s efforts to make Junior look more like a man – first by having his pencil mustache shaved off and then by replacing his beret with a more manly hat. We also see in this sequence that John King’s daughter, Kitty (Marion Byron), has just also returned home from college in the East and that she and Junior had developed something of a romantic attachment while studying there. Naturally, Junior and Kitty are thrilled to discover that they have wound up together in the same Midwestern city. But their respective rivalrous fathers are dead set against seeing their relationship move forward. We now move to slapstick mode, as Junior tries to adapt himself to working on the family steamboat and live up to his father’s expectations. At the same time, Junior is hoping to sneak over to the other boat so he can meet up with Kitty. Some of the slapstick scenes shown here (several shots more than a minute in duration) must have been very carefully planned in order for all of the acrobatic Keaton’s coordinated movements to have worked out so perfectly. But it all comes to naught, as Bill, Sr., finally gets fed up with his son’s uselessness and buys him a bus ticket to go back to Boston. Just as Junior is about to leave, though, Bill, Sr., learns that his steamboat has been officially condemned by the authorities, and he assumes that John King is behind the move. So, true to his character, Bill, Sr., physically attacks King and gets quickly thrown in jail. Seeing what has happened, Junior decides not to leave town just yet and to see what he can do to get his father out of jail. However, Junior’s efforts to sneak some breakout tools (hammer, wrench, etc.) to his father by concealing them inside a loaf of bread come to naught. Although he does help engineer a temporary breakout, after some more slapstick, his father lands back in jail, and Junior winds up getting knocked out and sent to the hospital. At this point, after all this slapstick, we have Bill, Sr., in jail and Junior in the hospital. The outlook doesn’t look good, and the weather forecast is gloomy. In fact now the weather takes over completely, and a horrific thunderstorm hits the town. It has become time for the maelstrom. Although these scenes shown here don’t show much narrative continuity, their depiction of cataclysmic annihilation stand out as some of Keaton’s most memorable visual images. In particular, as we watch these shots of chaotic physical destruction, we can only marvel at how Keaton managed to stage them. 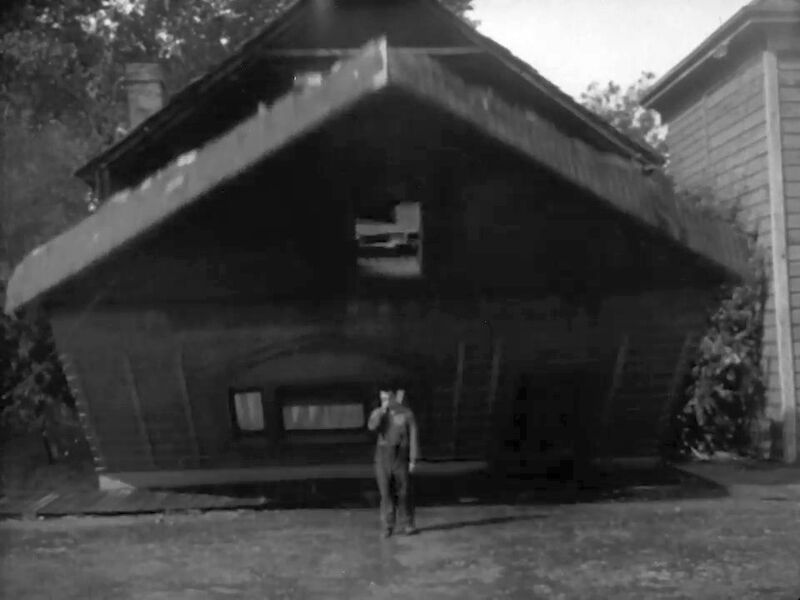 These were in the days before most special effects could be conjured up, and most of these destructive shots had to be executed in one take – reshooting a building collapse, for example, was presumably not an option. As the storm mounts in ferocity, we first see people being blown off their feet, and then cars are shown being blown down the street from the intensity of the wind. 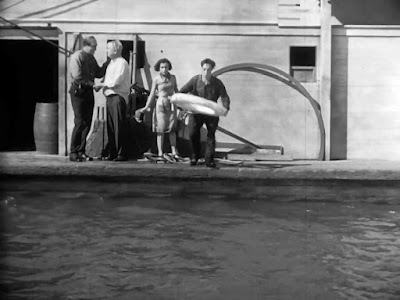 Then we see Steamboat Bill’s boat breaking away from the pier and being blown out into the river. As things get worse, buildings are shown being destroyed by the force of the wind. Over in the hospital where Junior is still lying unconscious, he finally awakens just as the entire hospital building is lifted off the ground and blown away. Then, still lying in his hospital bed, he finds himself and the bed being blown down the street into more chaos. This leads up to the most celebrated shot in the film. Junior stands up just as the entire wall of a building falls and crashes down onto him – but he is saved because the open 2nd-floor window of that wall just happens to fit around and clear his body. How Keaton had the courage and confidence to stage that shot is still amazing to me every time I see it. Finally, the jail building, with Bill, Sr., still confined in his cell, gets blown into the river and starts slowly sinking. And then at this point, Junior gets blown into the river, too, and he manages to swim over to his floating steamboat and scramble aboard. Now an astonishing transformation seems to come over Junior. While still acting in his usual bumbling way, he somehow changes from being a useless fop to an unlikely heroic savior. And there are plenty of people around him in desperate need of being saved. As he looks out from the deck of his steamboat, he separately sees in the water his father in his sinking jail and Kitty clinging to another sinking building. But the intrepid Junior breathtakingly manages to single-handedly steer his steamboat over to each of them and perform the rescue. Then he rescues his father’s hitherto enemy, John King, who is also swimming in the water after his own steamboat has sunk. All this leads to a joyful coming together and reconciliation on the part of John King, Bill, Sr., Kitty, and Junior. With their lives having been saved, they all seem finally relieved. But the ever-mindful Junior realizes that if he wants to marry Kitty right away, there is still one more person (the church pastor) he needs to save from the water. All in all, Steamboat Bill, Jr. is one of Buster Keaton’s most satisfying films. The real narrative development in the story concerns, as it does in a number of Keaton’s tales, the transformation of the protagonist from a naive greenhorn into a highly competent get-things-done master. And the film’s lasting image is that single-take falling-wall scene, in which the entire action of the falling wall is shown without an editorial cut. Andrew Sarris, The American Cinema: Directors and Directions, 1929-1968, E. P. Dutton & Co. (1968), p. 62. Kevin Brownlow, The Parade’s Gone By, (1968), passage quoted in Diane Christian and Bruce Jackson (eds. ), “Buster Keaton ‘Our Hospitality’, 1923”, Goldenrod Handouts, Buffalo Film Seminars, (XXI:1), The Center for Studies in American Culture, State University of New York, Buffalo, NY (31 August 2010). Mordaunt Hall, “THE SCREEN; A Gloomy Comedy”, The New York Times, (15 May 1928). Diane Christian and Bruce Jackson (eds. ), “August 31 ‘Buster Keaton Sherlock Jr.’ and ‘Steamboat Bill Jr.’ 1928", Goldenrod Handouts, Buffalo Film Seminars, (IX:1), The Center for Studies in American Culture, State University of New York, Buffalo, NY (31 August 2004).